No matter how long you have been programming, sooner or later you start thinking about how to make the process agile and its results more bug-free and productive. So, you spend a while in an attempt to find a service, extension or tool that will provide the functionality you are looking for. Having been surfing the web for a while, you might be either happy to have found THE ONE or confused about / disappointed with the options you have discovered. In case you ended up with the second outcome described, we have done some research to provide you with the API development solutions you will love working with. No matter what stage of development you are currently at, there is something that will be helpful at this very step. You will find OAuth 2.0 Playground very helpful if you are doing some work with OAuth 2.0 and APIs. It displays HTTP requests and responses at each stage of the OAuth 2.0 flow.If you are looking for an instrument that would send and receive custom HTTP/REST requests and responses as well as allow you to save them for later reuse, DHC - REST/HTTP API Client is what you need. It was created to make not just HTTP/REST resource discovery, but also manipulation and testing easier. Your REST testing will go smooth with Postman - REST Client, a tool that is much appreciated by a large number of developers all over the world. It will help you create requests and document & share your API. Have been looking for a free cross-platform testing solution? SoapUI is just the one. The test environment it provides supports every possible standard protocol and technology. By using this open-source tool, you will be able to create and execute automated functional, regression, compliance, and load tests fast and effortlessly. One of the finest API management options you may find is 3scale. This powerful platform will take care of API access control & security as well as policy management, API traffic monitoring and analytics, and billing & payments management. To find more browser extensions, testing & debugging solutions, API tooling options, documentation generators, and many other worthy tools, download a FREE whitepaper we compiled for you. 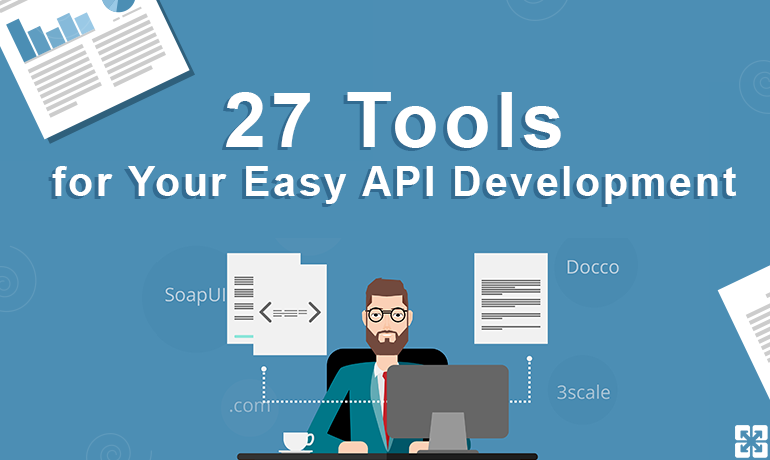 Create your perfect working kit with the fine solutions from 27 Tools for API Developers.